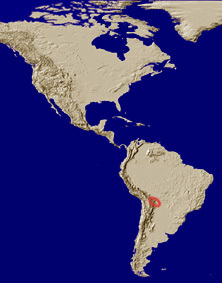 Distribution: Localized in the Bolivian Yungas, La Paz, and Cochabamba Province (Lachaume 1985). Description: Pronotal horn in males without tubercles or small horns either side of large horn. Pronotal horn with dense pubescence extending from venter of pronotal horn over anterior face of pronotum. Protarsomere 5 thickened in males, venter of protarsomere 5 with stout spinules in both sexes. Pronotum and elytra black in both sexes. Clypeus in females narrowly rounded at apex. 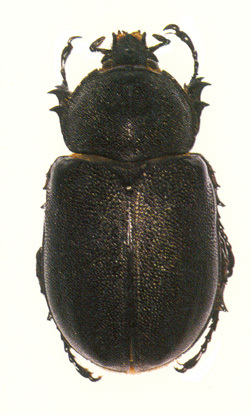 Biological Data: Dynastes satanus is infrequently seen and a limited number of specimens have been collected since D. satanus was described by Moser (1909). Biological and ecological information on this species is non-existent. However, in order to supply the highly coveted specimens for collections around the world, Japanese beetle enthusiasts are rearing D. satanus in captivity. Dechambre, R.-P. 1981. Diagnose de la femelle et désignation du néallotype de Dynastes satanus Moser (Coleoptera: Dynastidae). Bulletin de la Société Entomologique de France 86: 247-248. Endrödi, S. 1985. The Dynastinae of the World. Series Entomologica, Volume 28, W. Junk, Dordrecht. 800 pp., 46 plates. Lachaume, G. 1985. Dynastini 1: Dynastes - Megasoma - Golofa. Les Coleopteres du Monde 5. Sciences Nat, Venette, France. 85 pp., 29 plates. Larrouy, G. 1981. Dynastes satanus Moser: nouvelle découverte et description des pièces génitales du mâle (Coleoptera: Dynastidae). Bulletin de la Société entomologique de France 86: 244-246. Moser, J. 1909. Eine neue Dynastes-Art. (Col.). Deutsche Entomologische Zeitschrift 1909: 112-113.